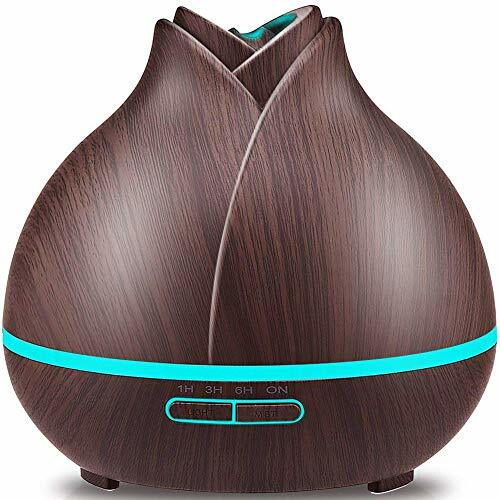 Wood Grain Coated: Nice dark wood grain coated, looks like a real wood diffuser. 400ml Large Capacity: Large water tank can hold 400ml water. This diffuser can keep running more than 10 hours. Multifunctional: You can choose high or low mist mode, set 1H/ 3H/ 6H / continues on running time and select 7 lighting color between bright and dim. The light can be turned off completely if you don't want it when you sleep. Waterless Automatically Shut-off: Automatically turn off the diffuser when the diffuser runs out of water. 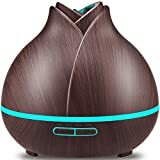 This diffuser is perfect if you want to use a diffuser during sleep. BPA Free: All URPOWER diffuser made from BPA Free plastic. Even safe for babies.